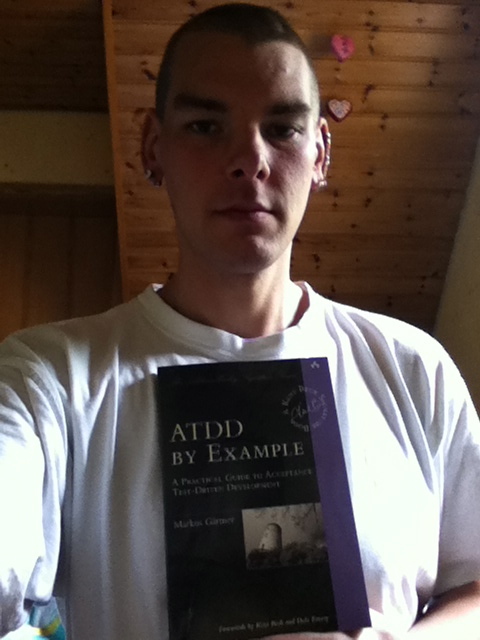 It seems that my book ATDD by Example: A Practical Guide to Acceptance Test-Driven Development is now available at least for Kindle. I received my first physical copy last week. So far amazon lists the physical copies due for end of this week. It’s been quite a journey since I approached Kent Beck with the idea for the first time two years ago. As I was unsure whether I could actually write a book in a non-native language, I decided to give it a try during the Pragmatic Programmer’s Writing Month in November 2010, and completed the first part from three within the first month. Skip forward a few months, and there it finally is. For the first of the two points, I was glad to incorporate some of the stuff that I learned while finishing up the major draft version around New Year’s and now in a series of articles for inform IT. The first one of these will get you started with ATDD. It’s called Getting Started with ATDD: Overcoming the Biggest Mistakes Right from the Start. For the second point, I have a deadline nearby middle of July to return any corrections for the second printing by then. So, if you happen to find any “bugs” in the final manuscript – and I know there are lots of it, although I decided to read through it several times – I would be more than glad if you dropped me line about it, so that I can get it corrected in the next printing. I figured that I spread around some easter eggs from time to time in the projects that I am involved in. If you happen to find one, please keep it to yourself in order not to spoil others who are looking for it. I think I should set up a challenge around this some time in the future. Maybe I will spread a free copy of my next book then. On the title, why did I call it ATDD by Example rather than Specification by Example by Example: Well, I think the name “Specification by Example by Example” would be stupid. A recent client gig where I consulted on “Specification by Example” I also found myself in the situation where a business expert asked me: “Does Specification by Example mean ‘all specifications’?” Since then I am convinced that we didn’t solve the naming problem – and I wonder if we will have to. For more on the name, make sure to read the preface. I explain why I picked that particular name – and a whole lot more on the background. One final word: If you enjoy the book, tell others, so they read it. If you are disappointed or have any criticism, please tell me so that I can improve myself. Thanks. Enjoy.